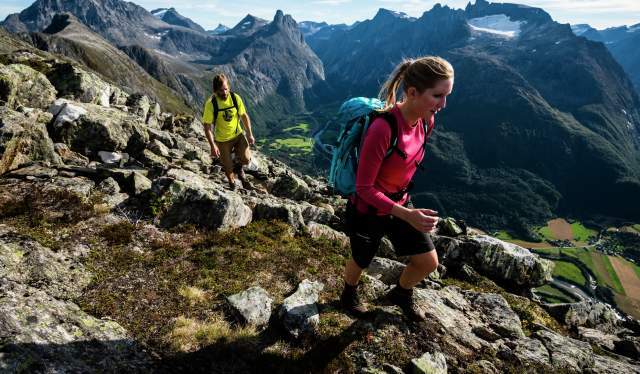 From the Romsdalseggen ridge, you can enjoy the view of the Romsdal mountains Kongen, Dronninga, and Store Trolltind. A large part of the hike goes along the ridge, and you should only set out if the weather so permits. on this beautiful adventure. Children may have difficulty completing the entire trip, and if you are hiking with a dog, you must be prepared to help him over the steepest sections. The trail is well marked and you will get a map and a route description on the Romsdalseggen bus. Wear good hiking boots. The terrain is rough, and it is crucial to have ample leg and ankle support. Occasional strong gusts can occur as you cross the ridge, so please wear wind and waterproof outerwear. An extra set of clothes including a cap, a scarf, and gloves or mittens belong in your backpack. In the summer season (1 July–30 September), you can take the Romsdalseggen bus from Åndalsnes train station. If the weather is good during the first weekends of October, the season may be extended. If you drive by car to Åndalsnes, you should park in one of the long-term parking areas. In the city centre, there is only short-term parking. You can also drive to the starting point of the hike, which is the parking lot at Vengedalen. Find more information about Romsdalseggen. In the summer season (1 July–30 September), you can take the Romsdalseggen bus from Åndalsnes train station. If the weather is good during the first weekends of October, the season may be extended. If you drive by car to Åndalsnes, you should park in one of the long-term parking areas. In the city center, there is only short-term parking. You can also drive to the starting point of the hike, which is the parking lot at Vengedalen. 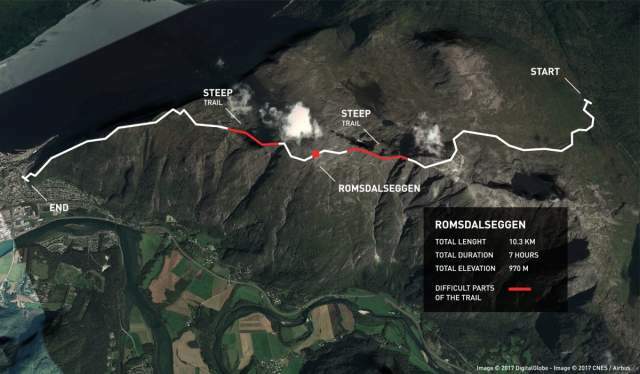 Find more information about Romsdalseggen. There are many other hikes around Romsdalseggen and in the nearby areas, including easier options. Check out the hiking alternatives in the area on Visit Northwest’s official website.